﻿Silvis is a member of a large regional area known as the Quad Cities. The Quad Cities region is situated across four counties in Illinois and Iowa. 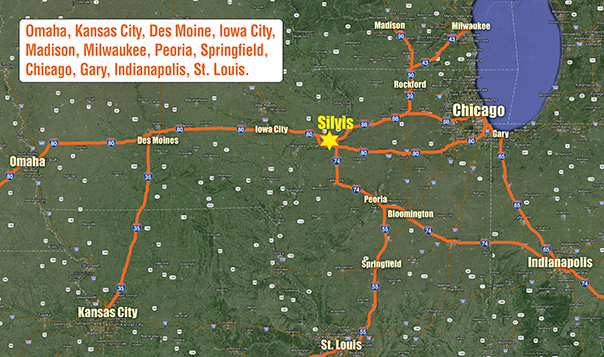 Silvis, Illinois is the first community you come to when entering the Quad Cities from the East on Interstate 88. Only 4 miles from the intersection Interstate 80 & 88 access to markets in Chicago, Des Moines and Omaha are just a few hours away. The Greater Quad Cities Region is served by four interstate highways, five United States primary highways, and an excellent secondary highway system that combine to provide efficient movement of goods, services, and people within the Region and to other markets. Interstate 80 connects the Region with both coasts. Interstate 88 provides direct access to Chicago. Analysis of highway transportation relative to other Midwest cities indicates that the Quad Cities ranks among Indianapolis, Chicago, and St. Louis in terms of competitive advantage for the transportation of goods. Commercial and recreational air travel to and from the Greater Quad Cities Region is easy via the Quad City International Airport (QCIA). The QCIA is a commercial airport served by five major passenger airlines offering approximately 60 daily inbound / outbound flights to eight major hubs nationwide. Nonstop service to these cities connects to hundreds of national and international destinations. Annually the QCIA serves nearly 1 million passengers and 4 million pounds of freight. Currently there are three rail companies with tracks in the Greater Quad Cities Region. The Burlington Northern Santa Fe Railroad, Canadian Pacific, and the Iowa Interstate Railroad all provide connections with other markets. Additionally, efforts to establish passenger rail service from Chicago to Omaha via the Quad Cities continue to grow. The Mississippi River is a defining characteristic of the Greater Quad Cities Region and has been a source of food, commerce, and recreation for hundreds of years. In the Greater Quad Cities Region, the Mississippi River traverses more than 80 miles, providing transportation and recreation opportunities for businesses, residents, and tourists. Currently there are more than 45 Mississippi River barge terminals in the Greater Quad Cities Region, many with access to rail.